BOSTON, Mass. 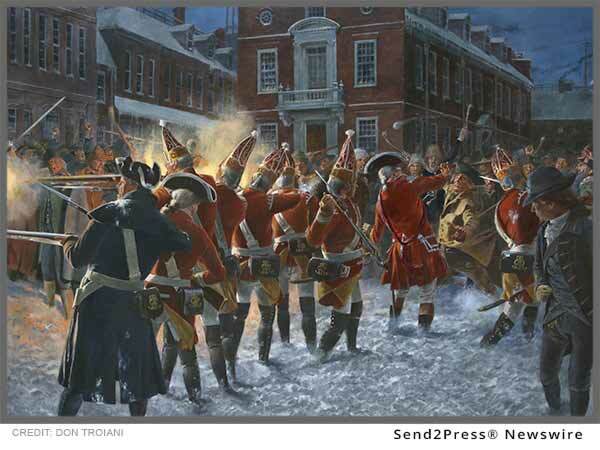 /Massachusetts Newswire/ — Nationally renowned Southbury Connecticut artist-historian Don Troiani has unveiled his painting of the momentous Boston Massacre. That encounter on a cold March night set forth a series of antagonistic events that climaxed in the start of the American Revolution 5 years later. Most people today are familiar with the famous Paul Revere engraving of the subject, but that was a carefully crafted propaganda piece designed to demonize the British and not to accurately reflect what really transpired. Using actual accounts from original trial depositions, consultations with historians and in-depth research into the material culture of the time, Troiani was able to recreate this seismic event as it would have appeared to an actual participant. Troiani’s artwork is represented in many institutions nationwide including the Smithsonian Institute, West Point Museum, National Park Service, Pentagon, Washington Monument, Booth Museum of Western Art and private collections. The Boston Massacre was a defining moment in American history. Sparked by a barber’s apprentice taunting a British officer over an unpaid bill, it was the culmination of growing tensions between the town’s inhabitants and soldiers of the King’s army since they arrived in Boston on October 1, 1768. On March 5, 1770 Private Hugh White of the 29th Regiment of Foot was standing guard before the Customs House in Boston. Having witnessed Edward Garrick verbally assault Lieutenant – Captain John Goldfinch, he reprimanded the youth with a strike to his head with his firelock. This ignited a fuse of retaliation. A “motley rabble of saucy boys, negroes and molattoes, Irish teagues and outlandish jack tarrs” swarmed upon White with clubs and staves. Overwhelmed, the sentry called out for relief. As the mob continued to grow and become more violent, church bells began to ring. Corporal William Wemms managed to lead a guard of six grenadiers from the 29th Regiment to relieve the sentry. Unable to escape to the main guard house, they formed a semicircular line and leveled their bayonets at the breasts of their adversaries. Within moments, Captain Thomas Preston worked his way to take command. Within the chaos, many individuals stood out. Henry Knox and Richard Palmes both approached Captain Preston and inquired if his men would fire upon the inhabitants. Benjamin Burdick, a Town House Watchman, struck a soldier’s firelock with a Scottish broadsword. As the crowd grew more and more agitated, a man in a dark gold trimmed suit walked behind the soldiers and encouraged them to fire. Without warning a shot rang out. Crispus Attucks, a mulatto sailor, fell to the ground. After the smoke cleared that cold winter’s evening, blood spattered the snow. Three men lay dead, a man and boy lay mortally wounded, six men were taken away to recover from their wounds and a day of infamy was recorded in the annals of American history.